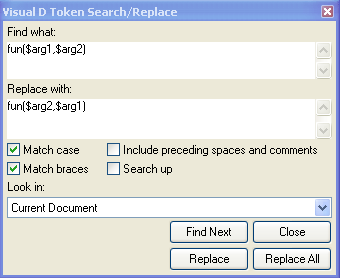 A token consists of the actual lexical D element and any preceding white spaces including comments. The search and replacement texts are tokenized according to the D language, matching the result against the tokenized source text ignoring syntactically unimportant text like comments and line breaks. Brace matching is supported, allowing to match nested expressions nicely. Executing 'Replace All' will exchange the arguments of all calls and declarations of function 'fun' in the current document, even if the arguments span multiple lines and include nested expressions. $_exprNAME - any sequence of brace matched tokens terminated by closing bracket or ";"
token$NAME - any token starting with "token"
NAME can be any alpha numeric identifier. 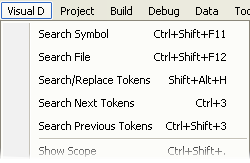 Any $-token used in the replacement string is replaced with the identically named capture from the matched search string. $* is relaced by the the whole matched string.